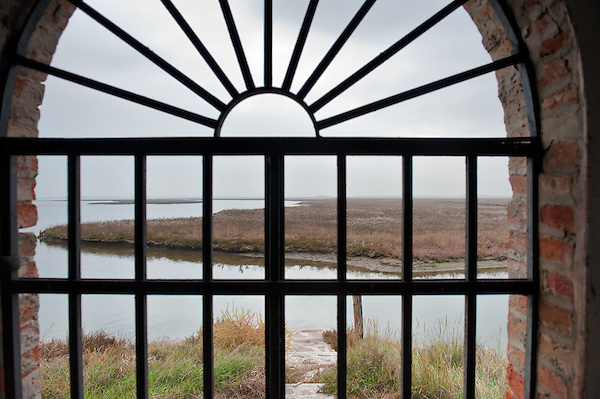 Sant’Ariano island is located in the Northern Lagoon, between Torcello and La Cura islands, north of La Centrega marsh. In 1565 the island was surrounded by a wall to preserve the bones and ashes dug out of Venice cemetery (San Michele) when more room was needed on those grounds. Today, the island is disused and it is believed to plagued with snakes. With my fellows partners we sailed to S Ariano and walked all around the perimeter wall, we tried in few places to reach the centre of the ossuary but a deep ravine and thorny bushes prevented us. We would have needed a machete! The dead were defending themselves, sending away the intruders. There were mice not sure about snakes we just managed a brief glimps of some tombstones and bones but it was impossible to reach them. "Go Back Home!" said the tenants of Sant'Ariano.